Richard Gilbert, MD was born and raised in the Midwest, graduating from the University of Nebraska Medical School, Omaha in 1975 and completed his psychiatric residency from the University of California Davis in 1979. 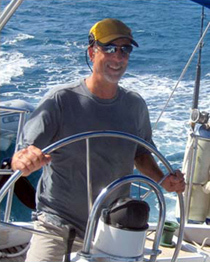 Since 1979, he has been in private practice in Aptos, CA. Dr. Gilbert’s practice is split between children/adolescents and adults and he sees a full spectrum of childhood/adolescent disorders. Dr. Gilbert is involved with Dr. Daniel Amen of the Amen Clinics who works in the neuropsychiatry field and with brain SPECT scans (Single Photon Emission Computed Tomography). Brain SPECT imaging is a proven, reliable measure of cerebral blood flow. Because brain activity is directly related to blood flow, SPECT effectively shows us the patterns of activity in the brain. SPECT allows physicians to look deep inside the brain to observe three things: areas of the brain that work well, areas of the brain that work too hard and areas of the brain that do not work hard enough. Brain SPECT imaging provides objective diagnostic information of a living brain so he can better target treatment. A SPECT scan also allows patients to understand why specific treatments are indicated, which medications are likely to be most helpful, and what other interventions may be indicated. A special interest of Dr. Gilbert’s is Functional Medicine which emphasizes a definable and teachable process of integrating multiple knowledge bases within a pragmatic intellectual matrix that focuses on functionality at many levels, rather than a single treatment for a single diagnosis. Functional medicine uses the patient’s story as a key tool for integrating diagnosis, signs and symptoms, and evidence of clinical imbalances into a comprehensive approach to improve both the patient’s environmental inputs and his or her physiological function. He is closely aligned with The Functional Medicine Institute and Metegenics, Inc.
Dr. Gilbert lives in Aptos, CA where he enjoys the many outdoor sports activities. He has a daughter who currently works for a financial firm in New York City, and a son who works for the San José Fire Department as a paramedic and firefighter.